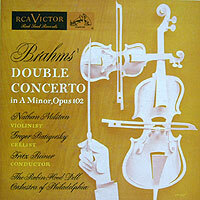 Johannes Brahms' Double Concerto for violin, cello and orchestra, Op. 102, is the remarkable realization of a composer's dream -- to create a new "super" instrument that transcends customary limits. In this article, we note the inspiration for the Double Concerto to restore Brahms's friendship with the great violinist Joseph Joachim, its cold initial reception, its predecessors, its structure, some of its most impressive recordings, and then some sources of information, both for this article and for further reading. Dreams free us from the constraints of reality and enable us to strive for the ideal. I imagine that composers often must dream of wondrous new instruments that transcend the sonic fetters of their time to realize their most far-reaching visions. In the 20th century Charles Ives, Harry Partch, John Cage and others managed to act on such impulses, but in the Romantic era it was Johannes Brahms (1833 – 1897) – ironically among the most conservative standard-bearers of his time – who led the way in his 1887 “Double” Concerto for Violin and Cello, Op. 102. By combining a violin and cello for the solo portions of his final orchestral work, Brahms was able to create a “super” stringed instrument with a sonority and range that neither alone could offer. Just consider the first time they are heard together, at bar 46 of the opening movement, as they careen smoothly in a single phrase from the top of the fifth position on the violin’s highest string to the cello’s lowest note and then back and forth again, as if Brahms were proudly displaying his new invention (but, typically for a composer firmly entrenched in the resources of the past, his creation was comprised of two unaltered traditional instruments). 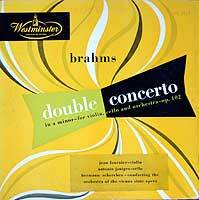 Yet the Double Concerto arose not from Brahms’s fantasies but rather from the harsh reality of a dissonant development in his personal and professional lives. His closest musical friend had been Joseph Joachim, the preeminent violinist of the time who had inspired many of his compositions, to whom Brahms had dedicated his only Violin Concerto, and upon whose advice Brahms constantly relied. But their bond ruptured during Joachim’s wife’s divorce proceeding after she disclosed a private letter of support Brahms had written to deflect Joachim’s accusation of an affair with Brahms’ publisher. As a result, the violinist felt betrayed and Brahms was faced with the loss of his closest musical collaborator. Robert Hausmann, the cellist in Joachim’s quartet, had asked Brahms to write a concerto for him, and so Brahms grasped that opportunity to entice Joachim back. 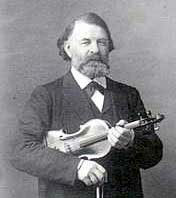 Richard Freed feels that the direct gesture of a new violin work would have embarrassed Joachim or led him to reject it, and so Brahms seized upon the notion of joining both instruments in a single concerto. (James Goodfriend further suggests that Brahms was motivated by the natural beauty of the Lake Thon region of Switzerland where Brahms was spending his summer vacation – as well as its plentiful beer gardens, which Brahms acclaimed.) Clara Schumann, who remained close to Brahms after the death of her husband, composer Robert, called the result a Versöhnungeswerk (a work of reconciliation), and indeed Brahms even incorporated a theme from one of Joachim’s favorite works, a Viotti violin concerto. Brahms rather gingerly wrote Joachim a formal post card to broach the possibility of his plan and then, after Joachim agreed, asked him to advise whether the preliminary sketches would be playable. (Joachim did offer substantial revisions, most of which Brahms ultimately disregarded.) In any event, the new work had its intended effect – Brahms, Hausmann and Joachim met at Clara’s home to rehearse the Double Concerto and gave a private performance at the nearby Baden-Baden casino on September 21, 1887. The public premiere followed on October 18, and the work was given several more times during that concert season. Early critics charged that the concerto was too cerebral. Biographer Richard Specht described it as “one of Brahms’s most unapproachable and joyless compositions … obstinate and mechanical, … cold and rigid. … Even the bright passages wear a frozen smile and the workings out are like equations. … Only here and there does a melodic bud timidly peep from behind the cracks of a solid wall.” The generally supportive critic Edward Hanslick dismissed it as “a product of a great constructive mind rather than an irresistible inspiration of creative imagination and invention.” Theodore Billroth dubbed it “tedious and wearisome – a really senile production.” Sadly, Brahms reportedly had been planning another double concerto but, in face of the equivocal reception to this one, abandoned the idea. 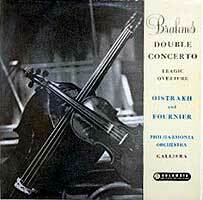 A far more balanced appreciation has since emerged, along with rationales for the Double Concerto's early neglect. Thus, a more recent biographer, Jan Swafford, cogently observed that in the Double Concerto, “For the first time in Brahms’s music one can hear a dissonance between Brahms’s art and the spirit of his age.” Donald Tovey expands that thought by suggesting that the novelty of an unfamiliar combination of soloists raised expectations that Brahms deliberately bypassed and instead treated his forces as familiar components for the expression of his customarily powerful and dramatic ideas. 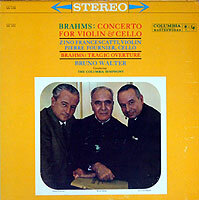 Goodfriend further explains that audiences of the time expected concertos with unabashedly emotional and virtuostic flair, rather than Brahms’s tightly-controlled integration into the orchestral fabric. He further notes with irony that this resolutely conservative piece was shunned in its time as “modern music,” but suggests that this was only because it was not readily understood. Many commentators assert that the combination of violin and cello as the solo complement of a concerto was unprecedented. Others, though, cite various antecedents. The most venerable among these is the Baroque concerto grosso, in which a soloist or small group is contrasted with an entire ensemble, and indeed Vivaldi, among others, wrote several such concerti for violin, cello and ensemble. Yet, while its opening dramatically juxtaposes the textures of the full orchestra and soloists, the Brahms Double Concerto displays none of the strict rhythmic pulse and constant propulsion that typifies the older model. Moreover, despite his own misgivings, Brahms’s writing for his soloists is idiomatic, whereas Baroque concerti parts are fungible, as evidenced by their many transcriptions for divergent instruments. The most recent precedent for this precise combination may have been an 1803 Concertante in C Major for Violin, Cello and Orchestra by Louis Spohr, which also had introductory solo cadenzas. Also often cited is Mozart’s 1779 Sinfonia Concertante, K. 364, for violin, viola (a part which Mozart may have written for himself) and orchestra, whose well-groomed, restrained interplay between soloists and ensemble seems a spiritual forebear of the Double Concerto. Alfred Einstein salutes its symphonic texture, melodies that rise above the gallant style of the time, organic construction and vitality of the orchestration, to which might be added that the work seems a synthesis of the Baroque concerto, in which the solo group was treated largely as a unified body, and the classical model, which exploited the contrast between soloists and orchestra, all within a deeply involving context which Alan Rich describes as “a profound conversation between two eloquent soloists with an eavesdropping orchestra profoundly moved.” Yet, Mozart seemingly tried to minimize the distinction between his soloists through the viola’s scordatura tuning of a half-tone higher for a brighter sound – and thus closer to that of the violin – although Jonathan Kramer notes that its impact of equalizing the different solo instruments is largely lost nowadays in light of the higher pitch and steel strings of modern orchestras. 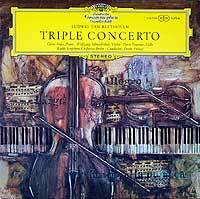 A final precedent is Beethoven’s 1807 “Triple” Concerto for Piano, Violin, Cello and Orchestra, Op. 56. Rich notes that the solo trio combination was a favorite home entertainment medium of the time, both in the form of original works (which Haydn and Beethoven, among many others, produced in abundance) and arrangements of symphonies and operas, and thus was familiar to audiences as a comfortable domestic experience. Yet, the result strikes most commentators as a cold, dry, detached application of technique over inspiration (“art for art’s sake” in Tovey’s pithy view). Deryck Cooke ascribes its failure to the nearly insurmountable problem of having to enlarge the scope to enable each of the four forces of a genuine triple concerto to state each melody without overloading the structure (which, in turn, necessitated bland themes). He further notes that in an apparent effort to unify the texture, Beethoven wrote the cello part mostly at the very top of its range, and thus stripped it of much of its fundamental character. The most historically-aware of all the major composers of his era, Brahms surely was familiar with these models. Yet all were several generations old, and so Brahms had a stylistic blank slate upon which to craft his Double Concerto. Perhaps its most remarkable feature is the variety of ways in which Brahms uses his two soloists, although never in ostentatious display. The special nature of the work is apparent from the very outset, shaped by two solo cadenzas. After a mere four bars, the cello cuts off a commanding orchestral statement of the main theme by repeating the final three notes (including its lowest stopped tone), strains to reach the height of its comfortable range and then falls back exhausted. Encouraged by the winds’ offering of an empathetic lyrical theme, the violin mimics its end, trades increasingly energetic imitative and supportive phrases with the cello and then, in the astounding passage we noted at the outset, they meld into a “super-instrument” by passing a rollicking phrase back and forth to show their full combined range from the depth of the cello to the height of the violin, after which they pause for breath and then proclaim their harmonious companionship in rapid passagework of unified octaves. The psychology of this introduction not only speaks for itself with eminent musical sense but symbolically seems to express and resolve the strain between Brahms and Joachim. they are variously playful (as in bar 120), contrary (126), sweet (152), gruff (190), unison partners (175), friendly competitors (180), melodic generators (218) and harmonists (167); they support (220) and imitate each other (152), complete each other’s phrases (132), serve as the other’s accompanist (152) and comment on each other’s roles (242). In a brilliantly inventive moment they provide a near-perfect complement of contrary motion (262) in a remarkable passage that looks as compelling on the page as it is to hear. As in most concerti, the opening movement bears the primary weight. The second, andante, movement is a simple ABA song structure built on a gorgeous tune given at the outset by the soloists playing in octaves, the purest musical harmony of all. The recurrent theme of the rondo finale (ABACABA) has a gypsy flavor, reflecting the huge success of Brahms’s Hungarian Dances (and, indeed, at the same time as the Double Concerto he was writing a set of 11 Gypsy Songs for vocal quartet and piano). The soloists introduce both the main theme and each intermediate one while recalling most of the techniques displayed in the first movement. Brahms’s own interpretive expectations for his orchestral work are hard to discern. Between the two conductors to whom he entrusted his own works, he admired both the interpretive freedom of Hans von Bülow and the restraint of Hans Richter – yet he occasionally slammed the former’s readings as “calculated for effect” and disparaged Richter’s performances as dull, gray and uninspired, even while praising Richter’s similarly restrained successor Felix Weingartner as a “healthy, fresh personality” who gave “truly wonderful” performances that were a mirror of Brahms’s own conception. To complicate matters further, we have a remarkable document – a primitive 1903 recording of two Brahms Hungarian Dances by none other than Joachim himself! While some tend to discount the result as the ravaged technique of a very frail man no longer in control of his instrument, they burst with unfettered passion and compel respect for an outsized personality who felt free to tear the notes right off the page. So perhaps the only key to appreciating recordings of the Double Concerto is to recognize that Brahms had no consistent esthetic outlook and that its dedicatee marched to his own remarkable drummer. 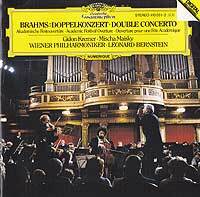 The Double Concerto still is rarely heard in concert. Lawrence Gilman pinpoints the problem succinctly – it requires superstar soloists who must sublimate their egos and share the spotlight, of which there is precious little. It has fared far better on record. The ones noted below exhibit a wide range of approaches to the crucial match of soloists, both to each other and to the orchestra and conductor. Jacques Thibaud, Pablo Casals; Pablo Casals Orchestra of Barcelona, Alfred Cortot conducting (1929, Victor 78s, Pearl or Naxos Historical CD) – Amid their considerable solo careers, Thibaud, Casals and Cortot formed a trio and toured for one month each year from 1905 until 1934, when politics irreparably fractured their union. Their 1926-8 recordings of trios by Haydn, Beethoven, Schubert, Schumann and Mendelssohn remain compelling for their heady blend of impulsive exploration and mutual respect for each others’ different personalities. 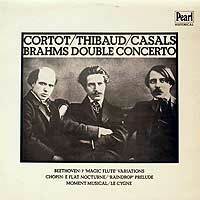 The same feeling animates this first recording of the Double Concerto. The potential tension between Casals’ intense, full-bodied, assertive and occasionally gruff cello and Thibaud’s relaxed, lissome, smooth and sweet violin lends a constant air of anticipation, as their disparate personalities blend and diverge at apposite moments. Thus, Casals adds a sententious pause before his first entrance, as if to proclaim his authority, but then devolves into honeyed warmth to accompany Thibaud’s counterstatement, and for his part Thibaud often roughens his own textures to complement Casals’. Cortot, whose only other orchestral recording was of a quirky and unruly but deeply impassioned set of Bach Brandenburg Concertos, traded his piano for a baton. The feeling of overall unity is completed by the Barcelona orchestra that Casals had founded and nurtured, which plays with tangible commitment – brisk but patient, and fully empathetic to the needs of their esteemed colleagues. The original recording was thin, and prior LP and CD transfers were rather wan, but has been restored to magnificent, full-bodied sound in Mark Obert-Thorn’s Naxos CD. 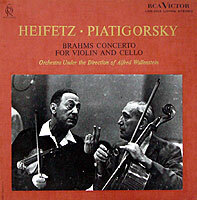 Jascha Heifetz, Gregor Piatigorsky; RCA Victor Symphony, Alfred Wallenstein (1960, RCA Soria LP) – The 29-minute velocity of Heifetz’s earlier recording is exceeded (but only marginally – the timings of each movement are nearly identical) only by his stereo remake with his chamber music partner of many years, with whom he was about to launch a public series of “Heifetz-Piatigorsky Concerts,” whose very title suggests a collaboration among equals. A fellow Russian-American, Piatigorsky here shares Heifetz’s aversion to sentiment, yet projects a wider variety of mood than had Feuermann. Wallenstein, himself an accomplished cellist, manages to keep moving forward rapidly but with sufficient repose to avoid seeming at all rushed or forced. This is an exhilarating recording that conceals with superb musicianship and propulsive pacing the passages of the work that have been slighted as repetitive and mannered. Adolph Busch, Hermann Busch; French National Radio Orchestra, Paul Kletzki (1949, Music & Arts CD) – Walter Niemann asserted that the Double Concerto requires “two players of consummate technic and sure mastery, so thoroughly accustomed to playing together as can hardly happen except with members of the same family.” At least two recordings test his premise. The first is a 1949 concert by the brothers Busch. Violinist Adolf’s teachers were associates of Brahms, he had been playing the Double Concerto since 1911, and as the leader of the Busch quartet (in which his brother Hermann had anchored the cello seat for 20 years), he specialized in Brahms’s chamber music. Potter credits them as “two soloists with one mind” having “an almost telepathic sympathy,” but it’s hardly evident here; while they infuse the andante with glowing warmth from their unified vision, in the outer movements they often bristle with diverse phrasing and timing, as if to assert their individual personalities. While Kletzki provides a potent accompaniment, we can only wonder about added impact had the third Busch brother – the prodigiously talented conductor Fritz – been on the podium. 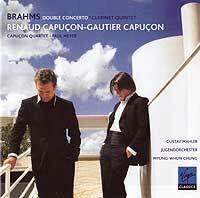 Renaud Capuçon, Gautier Capuçon, Gustav Mahler Youth Orchestra, Myung-Whun Chung (2007, Virgin CD) – Ironically, the most recent recording of the Double Concerto harks back to Joachim’s profoundly Romantic sensibility that inspired the work in the first place. The Capuçons’ deeply personal view is evident from the outset – although the opening cello cadenza is marked in the score “in modo d’un recitative, ma sempre in tempo” ("in the style of a recitative, but constantly in tempo"), Gautier takes extreme rhythmic (and dynamic) liberties, suggesting more of an intimate conversation than the narration Brahms specifies. Joined by his like-minded brother, their phrases are handed off with exquisitely delicate smoothness, leading to the slowest opening movement on record. It’s clear who’s in charge, as the deeply empathetic orchestral accompaniment is shaped to fit the soloists’ grand emotions. After a somewhat customary andante, the finale swerves between speedy orchestral and leisurely solo sections. Consisting entirely of musicians under 26, the orchestra displays a fully professional polish rather than the ardent enthusiasm that often distinguishes youth ensembles. 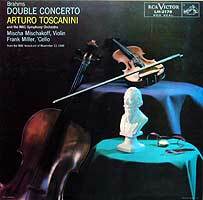 Mischa Mischakoff, Frank Miller; NBC Symphony Orchestra, Arturo Toscanini (1948, RCA LP, BMG CD; 1939, Pristine Audio CD or download) – A further approach to casting the Double Concerto is to eschew importing superstars for home-grown talent – the orchestra’s own concertmaster and first chair cellist. As would be expected, such soloists tend to coordinate closely with the ensemble, of which they remain an integral spiritual part, although here they occasionally provide just a slight spurt of angular phrasing or a touch of sweetness, as if to stand out against Toscanini’s crisp, focused propulsion, and perhaps to proclaim that they didn’t have to completely bury their individuality just because they devoted their careers to playing in an orchestra. Toscanini provides forceful and invigorating leadership that often is missing from his late Brahms studio recordings (and especially so in his flaccid 1952 Symphony # 3 that shares the BMG Toscanini Collection disc with the 1948 Double Concerto). Indeed, his 1948 broadcast strikes me as one of the finest vindications of Toscanini’s approach to music – he imposes no overt interpretation but rather illuminates the inherent splendor of the music through subtle emotional balance that suggests its shifting moods within a context of tight control and intense focus. By combining the velocity of the Heifetz records with just enough tempo variety to let his soloists have their say within a basic unified scheme, Toscanini coaxes the natural possibilities of the music to emerge. The rapid pace of the finale just slightly exceeds the soloists’ precision, and thus adds a humanizing sense of struggle. Yet, unlike the phenomenon of many of Toscanini’s other finely-chiseled records, it never seems fast, and thus provides a tribute to the emotional balance of the work. Overall, Toscanini defeats the notion that this is a dry intellectual exercise – at least not in the right hands. A fascinating comparison from Toscanini’s second season with the NBC Symphony has been issued in surprisingly decent sound by Pristine Audio featuring the same forces. Here, the sharp edges and what Harris Goldsmith aptly describes as the “single-mindedness … imperiously held together by Toscanini’s ironclad authority” of the 1948 reading are leavened by just enough flexible pacing and plastic phrasing to trade seat-edge excitement in favor of greater depth and emotional resonance. The result may not be quite as distinctive, but overall seems a more complete realization of the work. 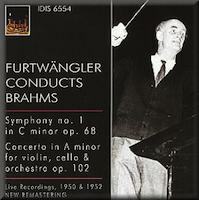 Willi Boskovsky, Emanuel Brabec; Vienna Philharmonic, Wilhelm Furtwängler (1952, EMI) – Furtwängler took the same approach by using the Vienna Philharmonic’s own leaders as soloists, but with results a world apart. With a pace over 20% slower than Toscanini in the outer movements, Furtwängler crafts a weighty, contemplative, highly romantic vision that fluidly adjusts the pace and squeezes feeling from every phrase, yet without ever losing a sense of forward continuity or overall fusion. Although his interpretation is the diametric opposite from Toscanini’s, the ultimate upshot is remarkably similar – a labor of intense love to ensure that no listener can possibly agree with critics who dismissed the work as cold and unfeeling. Unlike in most Double Concerto recordings, Furtwängler’s orchestra plays far louder than the soloists, thus ensuring that we view the work as a symphonic conception. Indeed, his soloists often have to dig into their instruments to distinguish their individual threads from the rich and fundamentally sweet-sounding orchestral fabric. Deeply serious yet empathetic, Furtwängler’s approach goes far to validate the deep feeling with which Brahms imbued his valedictory orchestral work. Another concert recording by Fritz Kirmse, Bernhard Günther and the Leipzig Radio Symphony Orchestra led by Hermann Abendroth (1950, Tahra CD) is conceived on a similar scale, but seems somewhat mechanical, without the final degree of masterful polish and confident maturity that distinguishes the Furtwängler reading. (I cannot find any information on either of the soloists, and so I presume that they were members of the Leipzig orchestra.) Further proof of the intangible Furtwängler magic comes from an equally deliberate 35-minute 1983 rendition by Gidon Kremer, Mischa Miasky and the Vienna Philharmonic conducted by Leonard Bernstein (DG). Its solos of unrelieved extreme sweetness, when combined with the consistently slow pace and shorn of Furtwängler’s cohesive sense of dramatic architecture, become wearisome and even suggest a somber academic exercise that threatens to validate the criticism of the work’s early detractors. 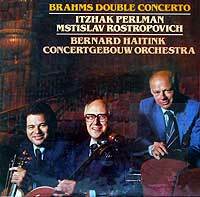 Itzhak Perlman, Mstislav Rostropovich; Concertgebouw Orchestra, Bernard Haitink (1980, EMI) – Perhaps symbolic of the basic fascination of the work itself, this recording presents a compelling balance of moderation and feeling. Haitink, among the most objective of conductors, and the Concertgebouw, renown for its tonal elegance, provide a relatively slow foundation that gives the soloists sufficient leeway to project just enough depth and accent to avoid a sense of irrational volatility and just enough charm – and even a bit of occasional schmaltz – to engage us without seeming cloying. A similar scheme animates the finale, as the soloists’ personal touches constantly enliven the regularity of the orchestral sections and ultimately end on a note of triumph with an outsized tympani roll. A 1970 Haitink/Concertgebouw Double Concerto with Henryk Szeryng and János Starker (Philips LP) has nearly identical timings, but the closer match between the soloists’ and orchestra’s temperaments proves far less engaging and seems drained of the remake’s allure. 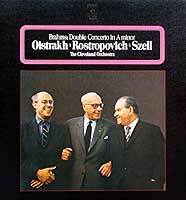 David Oistrakh, Mstislav Rostropovich; Cleveland Orchestra, George Szell (1970, EMI) – A somewhat different but equally successful blend of differing temperaments arose here, where Szell’s reputation as a strict perfectionist and his orchestra’s corresponding distinction for its classical demeanor, encounter two soloists of the volatile Russian school. Rather than presenting opposite sides of the work’s complementary characters, they meet in a comfortable middle with a sense of common purpose, as Szell crafts an empathetic setting and Rostropovich, in particular, sublimates his outgoing nature for a reading that radiates equal shares of integrity and commitment. Speaking of Russia, which has produced more than its fair share of fabulous string players, a relatively obscure 1950s LP (mine is on a “Hall of Fame Great Artists” label) by Oistrakh, Sviatoslav Knushevitski and the State Symphony Orchestra led by Karl Eliasberg beckons with fascinating potential, as it is the only recording I know of the Double Concerto in which not only the soloists but the orchestra and conductor were all Soviet. Yet, the orchestra functions as a mere offset to display the soloists’ ostentation, as they swoop into notes and thoroughly dominate the piece. (Sadly, the first movement is abridged by nearly half, thus depriving it of its accustomed import.) In a sense, the balance seems symbolic, of assertive individuals escaping from a faceless collective – and, indeed, most of the great Russian instrumentalists, including Rostropovich, blossomed only as expatriates. Nathan Milstein, Gregor Piatigorsky, Robin Hood Dell Orchestra of Philadelphia [the Philadelphia Orchestra in its summer incarnation], Fritz Reiner (1951, RCA LP) – Here, as in the Heifetz recordings, we have Russian soloists allied with an American orchestra and conductor. But in this case, the conductor had an unmatched reputation for strict control and precise perfectionism and, despite their Russian training, the soloists had become thoroughly Americanized. In any event, Reiner’s propulsive, plain-spoken outlook prevails to produce a reading that moves insistently forward and integrates all elements into a vision of single purpose propelled by great momentum, a consistently light touch, and no overt drama, thus compelling admiration for the purely musical aspects of a unified achievement. The andante, in particular, avoids any sense of getting bogged down in tedious sequencing and seems a logical and perfectly-judged link and transition between the outer movements. Zino Francescatti, Pierre Fournier, Columbia Symphony, Bruno Walter (1959 Columbia LP, Sony CD) – Lest the allure of the Russians lead us to ignore other nationalities, the elegance of the French team here finds an ideal partner in Walter’s late, mellow style, nicely complemented by the lean, clear sonority of his reduced West Coast orchestra. 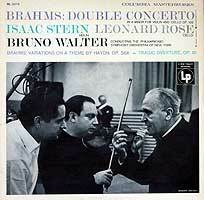 An earlier Walter mono LP had featured the American team of Isaac Stern and Leonard Rose with the New York Philharmonic (Columbia LP); although perhaps more generic, it’s a forceful, full-bodied and thoroughly idiomatic presentation. And just to show the difference a conductor and orchestra can make, Stern and Rose cut a far less appealing stereo release with Eugene Ormandy and the Philadelphia Orchestra (Columbia LP, Sony CD), whose smooth, casual accompaniment impedes the soloists’ enthusiasm (and seems more than a generation removed from their exciting 1939 venture with Heifetz and Feuermann). Stern demonstrates his remarkable flexibility by adapting to the deeply sensitive approach of cellist Yo-Yo Ma in a 1987 Double Concerto with the Chicago Symphony conducted by Claudio Abbado (CBS CD). David Oistrakh, Pierre Fourner; Philharmonia Orchestra, Alceo Galliera (1956, EMI LP and CD) – Music may be a universal language, but it’s spoken with many national accents. Here we have a virtual United Nations – a Russian violinist, a French cellist, an English orchestra and an Italian conductor, yet the result is not a cacophony of warring styles, but rather a diplomatic détente. Yet, rather than fuse into a uniform gray, the various colors produce a variegated effect of shifting hues, with flashes of each party’s quality (Russian muscular warmth, French elegance, English smoothness, Italian tautness) whose interplay maintains constant interest, as each occasionally emulates one of the others’ approach. Jean Fournier, Antonio Janigro; Vienna State Opera Orchestra, Hermann Scherchen (1952, Westminster LP) – With so many recordings suggesting a virtual contest of wills between the soloists and the conductor, here, as with the 1959 Walter reading, we have an appropriate and refreshing concept – a performance in which the two primary forces emerge as genuine allies rather than opponents struggling for supremacy to dominate the interpretation. Without ignoring the moderate degree of tension inherent in the score, Scherchen guides the orchestra and the soloists to smoothly hand off responsibility to each other and seem part of an integral process. As does Walter, Scherchen keeps the textures of his reduced orchestra light, so as to advance Brahms’s plan of providing just enough constrast and power to enable the soloists to stand out without overwhelming them. The feeling is enhanced by highlighting individual players and choirs from within the orchestra to match and meld into the solo lines, especially in the beautifully balanced finale. Overall, the approach suggests solidarity with the featured artists. The highly-acclaimed 1961 account by Wolfgang Schneiderhan, Janos Starker and the Radio Symphony Orchestra of Berlin conducted by Ferenc Fricsay (DG) takes that approach even further, yet perhaps too far, draining the work of any sense of strain in favor of a bland, cushy statement. copyright © 1998-2010 Peter Gutmann. All rights reserved.